Designing a structure implies a selection of optimal concept and sizing, with the aim of minimizing the weight and/or production cost. 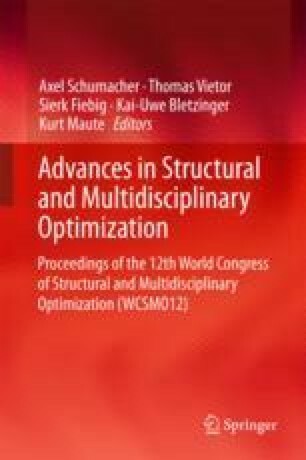 In general, a structural optimization problem involves both continuous variables (e.g., geometrical variables, …) and categorical ones (e.g., materials, stiffener types, …). Such a problem belongs to the class of mixed-integer nonlinear programming (MINLP) problems. In this paper, we specifically consider a subclass of structural optimization problems where the categorical variables set is non-ordered. To facilitate categorical variables handling, design catalogs are introduced as a generalization of the stacking guide used for composite optimization. From these catalogs, a decomposition of the MINLP problem is proposed, and solved through a branch and bound method. This methodology is tested on a 10 bars truss optimization inspired from an aircraft design problem, consistent with the level of complexity faced in the industry. This work is part of the MDA-MDO project of the French Institute of Technology IRT Saint Exupery. We wish to acknowledge the PIA framework (CGI, ANR) and the project industrial members for their support, financial backing and/or own knowledge: Airbus, Airbus Group Innovations, SOGETI High Tech, Altran Technologies, CERFACS. We would like to thank Charlie Vanaret for all his advices, specifically for the branch and bound formulation.